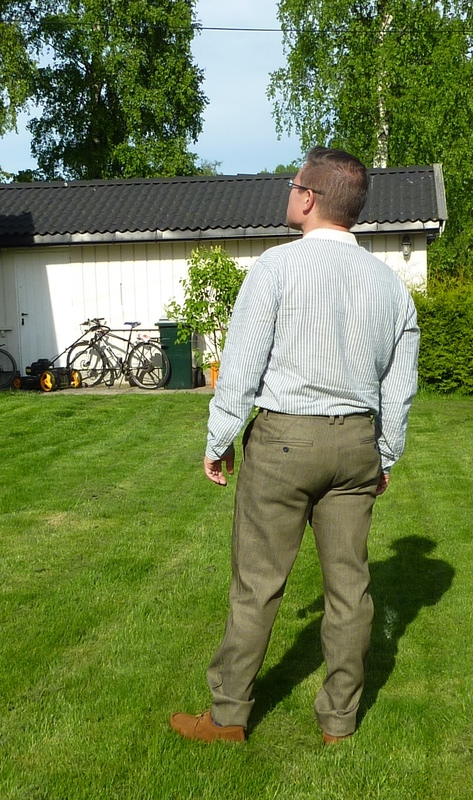 Trouser Tuesday: SOSO denim, not so so-so - Well Dressed Dad - It is a proper menswear blog. Like, with original words and opinions and suchlike. 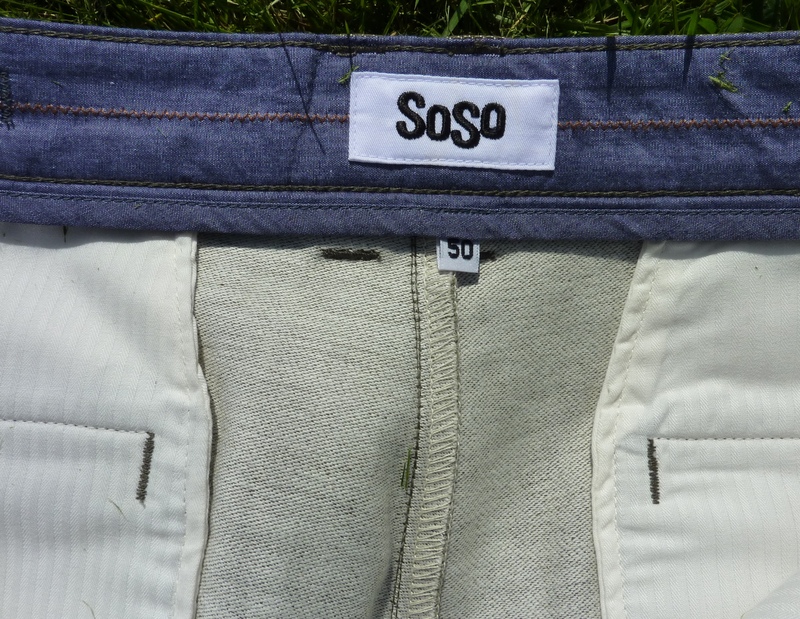 Today’s trousers come from Swedish up and coming denim company SOSO Clothing. I have to admit, given the unfortunate name of the company and a website that aggressively promotes their discounts, I wasn’t expecting their goods to be very good. Which just goes to show how easily preconceptions can be misleading, as I will proceed to show you as I present the case of an actually pretty decent pair of affordable jeans. To clear up something that made me curious right at the start: What is the deal with SOSO making limited edition jeans? I put this to Johan, one of the two guys behind the company and as he explained it, they only buy so much of each fabric and make as many pairs of trousers as they can from the available fabric. For a 25 metre roll of denim this will be around 20 pairs, and when they’re gone there are no more to be had. So what do I have here? 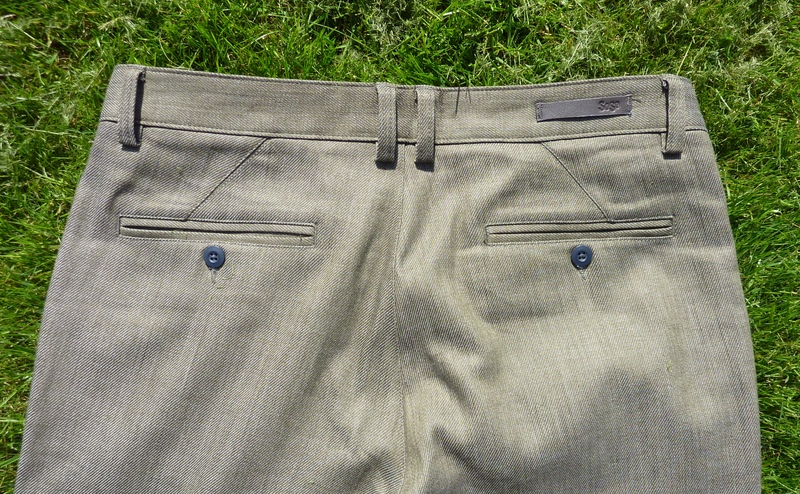 One of 20 pairs of Chevy Chinos in khaki green denim. Chinos in light green denim? Yes, that’s what it says on the box. I take this to mean that the style is a chino style, but the fabric used is a denim. Then again, both denim and chino fabrics are a cotton twill, so we may be splitting hairs here. The fabric itself is a lightweight denim with just a tiny little bit of stretch in it. Described as 9 ounce Japanese Kaihara stretch denim made from 98% cotton and 2% elastane. Now I know that in denim circles it’s not considered the done thing to have any stretch in your trousers. I would reluctantly agree, if you truly want the full and painful experience of wearing tight trousers that give no mercy. If you would rather appreciate a little comfort, a little stretch may make life a bit easier. Ever wondered how the ladies get their jeans to look like they’re spray-painted on? Stretch all the way, and lots of it. 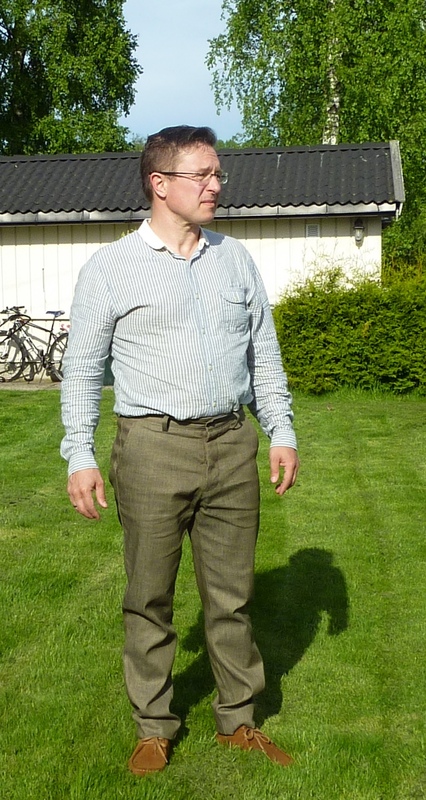 The first thing that struck me when handling these trousers was how nice the fabric feels. It’s lightweight, yes, but also soft, especially on the inside. The second was how tidily the trousers are made. There aren’t lots of fancy details or clever tricks, but what is there is made with obvious care and skill. You may think this is something that can be taken for granted, but sadly I see more half-assed and sloppy work than I see really well made garments. The rear features double centre belt loops and diagonal seams over the pockets, which are about the extent of design features above the norm. Nicely welted rear pockets with buttons on both. 6 belt loops like this is an improvement over 5, but ideally I’d like to see either 7, or a bit more space between the two centered ones. It helps the belt-waistline interaction noticeably. 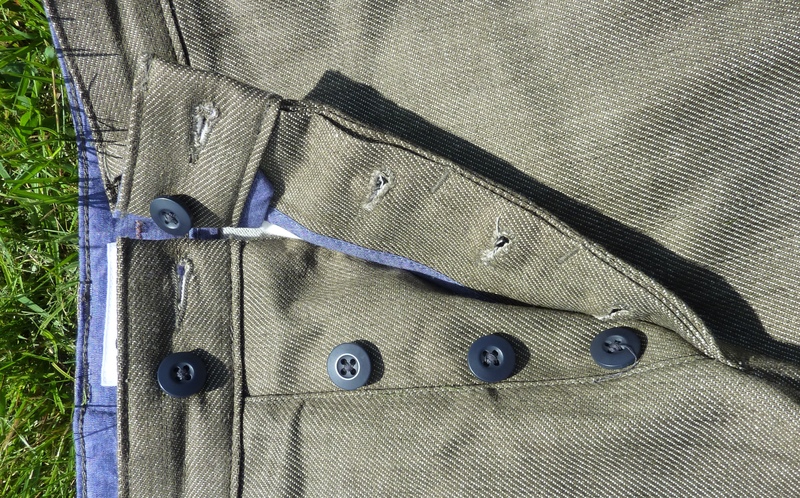 A buttoned fly with three buttons and double top buttons for safety and to help the waistline lay flat. Again we see the quality of construction in that the button holes are actually well sewn and the buttons don’t look like they’ll fall off any time soon. It may seem a small point, but it’s not something you can take for granted! I’ve had trousers at three times the price where the buttonholes have been coming apart and buttons dropping off within a day of the first wear. Nice cotton lining on the pockets and bar tacks where a little extra strength is needed. 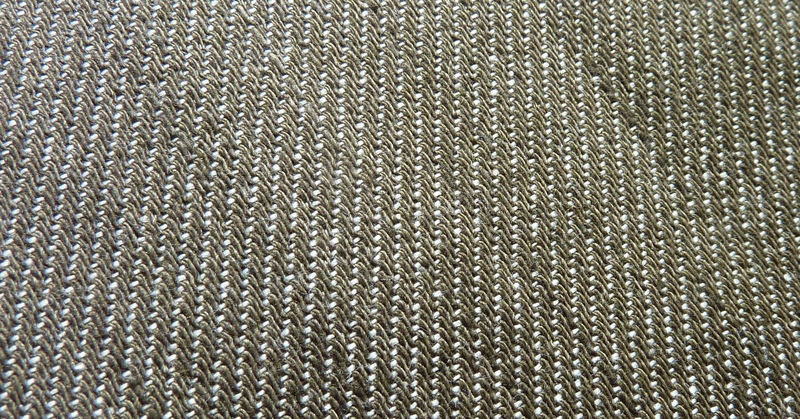 We can also see here the softer inside of the fabric. The waist lining is nicely lined and chain stitched, while the inner seams are a combination of overlocked and felled seams. Felled seams take time and give the best result, where overlocked seams are quick and dirty. The work here looks solid though and gives me no cause for concern. As delivered the trousers have generous inseam length. I have yet to hem mine, so they’re a little oversize on the photos. The denim is nice and lightweight to work with, so hemming can easily be done on a regular home-grade sewing machine. 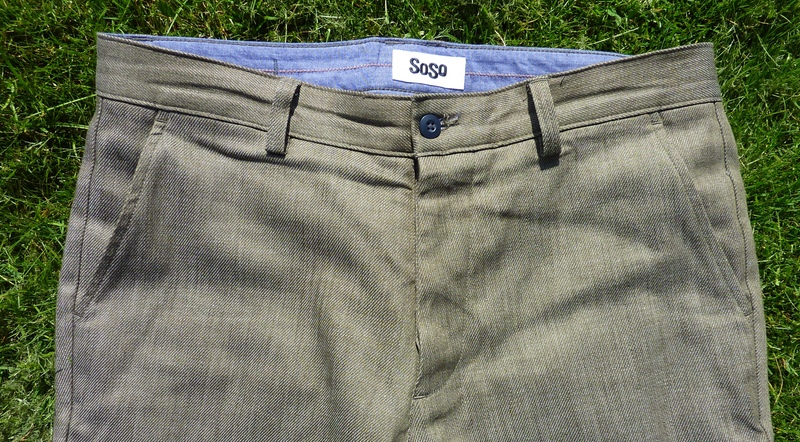 In summary, the most surprising aspect of these SOSO trousers is that they are far from being so-so. Given that the fabric is Japanese denim and construction is as good as it is, I think they’re actually something of a bargain. 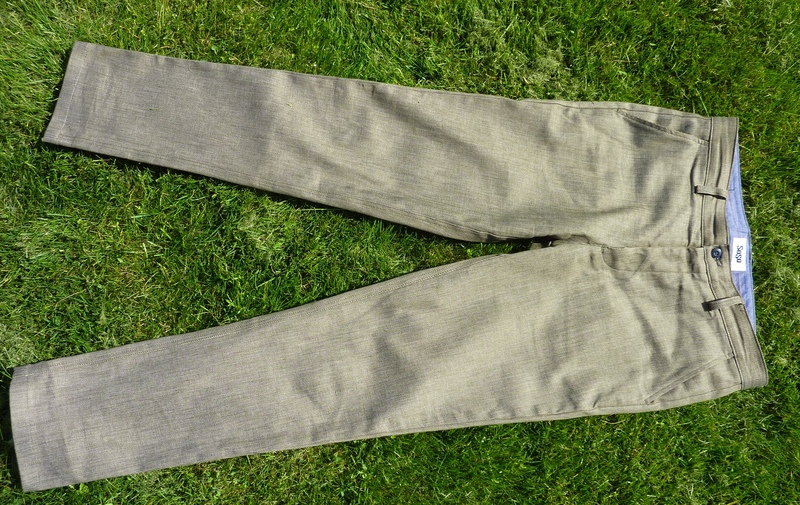 No, they’re not super-rare Japanse artisan jeans, but they are good, honest trouser that fit well and will most likely last a while. If you’re a guy looking for a dependable pair of jeans that won’t break the bank, you can’t go far wrong with a pair of so-so jeans from SOSO Clothing. Having now looked at two examples of Swedish denim, it strikes me that I should also be taking a look at some Norwegian and Danish variants. The world of denim is not all about Japan and the USA!